CARACAS/PUNTO FIJO, Venezuela (Reuters) - Carpenter Jose Narvaez had planned to flee Venezuela and emigrate to the nearby Caribbean island of Aruba towards the end of the year, until Venezuelan President Nicolas Maduro unveiled his plan to turn around the crumbling economy. Now the 43-year-old Narvaez wants to leave as fast as he can. Maduro on Friday stunned the South American nation by announcing a 96 percent devaluation and vowing to peg the bolivar currency to Venezuela's new 'petro', a cryptocurrency that experts have cast doubt on as a functional financial instrument. "I am looking for flights to leave on Wednesday, any way I can," Narvaez said in Venezuela's western oil hub of Punto Fijo, home to massive but deteriorated oil refineries. "I am sure this is going to get worse because the man's ideas lack all logic." Maduro, who argues that he is the victim of a Washington-led "economic war" designed to sabotage his administration through sanctions, said that using the petro will abolish the "tyranny" of the dollar and lead to an economic rebirth in Venezuela, an OPEC member state home to the world's biggest crude oil reserves. But many Venezuelans fear the measures - whose details have not been explained - could render the country even more anarchic, and say they will join the exodus. As the once-wealthy nation has slid into poverty, hundreds of thousands have already decided to leave. With the International Monetary Fund forecasting that inflation could reach 1 million percent by the year's end, malnutrition is on the rise, as a monthly minimum wage that amounts to a few U.S. dollars puts simple products like chicken out of reach for many. Families forage through garbage, parents skip meals to let their children eat, and adolescents clamber up trees to pluck mangoes. The United Nations estimates around 2.3 million Venezuelans now live abroad - with 1.6 million having fled in the last two and half years alone, the biggest movement of people in Latin America's modern history. That contrasts sharply with the twentieth century, when a booming Venezuela accepted immigrants from southern Europe, the Middle East, and neighbouring war-torn Colombia. In the capital Caracas, streets were quiet on Monday. Maduro had decreed a national holiday for the first day of a plan that will slash five zeros from prices in a bid to tame hyperinflation, as part of his economic package. Information technology worker Keila Leiba said she had planned to emigrate to Mexico by early 2019 but Maduro's announcements had led her to bring forward her plans. "I'm thinking short-term now. I may change my plans to leave within a month or a month-and-a-half," said Leiba, as she queued to submit paperwork for a coveted Spanish passport. "I don't see any opportunities here, nothing. You work, work, work, and ... you don't have access to the most important thing: Food." 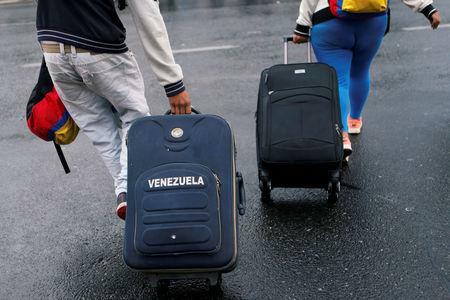 Many Latin American governments initially welcomed the migrants with open arms, remembering Venezuela's role in welcoming those fleeing dictatorships and conflict in the past. But the exodus has ballooned this year, stretching social services, creating more competition for low-skilled jobs, and stoking fears of crime. 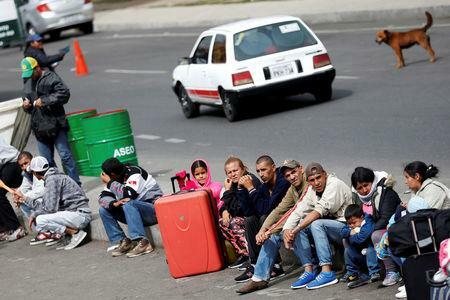 The sight of Venezuelans begging on street corners in cities such as Colombian capital Bogota and Ecuador's Quito is becoming increasingly common. 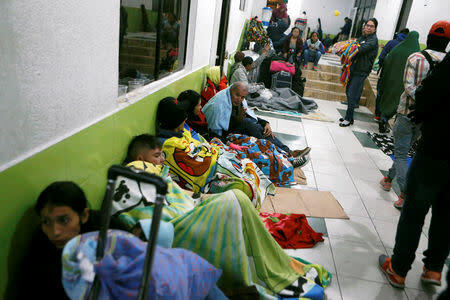 In the last week, both Ecuador and Peru have announced tighter entry requirements for Venezuelans, while in Brazil rioting locals drove hundreds of migrants back over the border. Speaking in a plaza in Caracas, sports teacher Maritza Hernandez, 60, said: "We accepted everyone here. They should give us an opportunity." One of her sons is in Chile; the other plans to emigrate there at the end of this year. Hernandez said she was hoping to follow suit in 2019. For many in Venezuela, the issue is now how to afford a move. "If it just depended on me, I would leave today," said restaurant worker Aries Armas, 21, who said she did not have enough money. "The influx of Venezuelans must be affecting countries, but if you want to leave now: where can you go?"